Today we introduce Love Design Wedding Accessories and Favors to you. Wedding is always full of romance and love! Share your love with your guests with HotRef gold love items and copper love items which are great to evoke a sweet and romantic atmosphere of your love wedding. And you can make some love design items as special wedding gifts for your guests that will remind them of your special day every time they use them. Easy to catch eye to set the LOVE Gold Place Card Holder on the table for guest's seating. The place card holder is made of resin with gold finish and classic "LOVE" letter design features a heart in place of the "O". Perfect for love or gold wedding. Remind your party guests of your special day every time they open up the wine bottle by the Love Antique Gold Bottle Opener. Each gold wine opener features the word "Love" that will perfectly tie in love or gold themed wedding. Decorate the yummy cake with this Gold Love Wedding Cake Topper to fit your love or gold themed wedding. Each cake topper is designed in "Love" motif and is finely crafted from gold acrylic. Share your love with your guests, Copper LOVE Bottle Opener is made from sturdy metal with copper finish, your guests will be feeling the love for a good long time! Great for love themed wedding. Give the most special cake you'll ever eat a little extra love with Geometric Copper Love Cake Topper! Made to look like genuine copper, the acrylic cake topper puts love front and center at your love theme wedding. 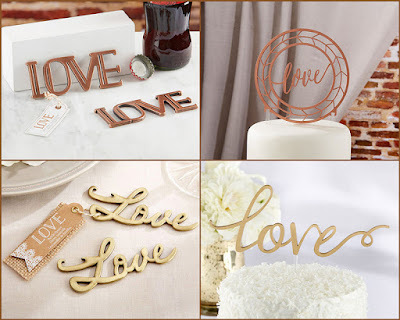 Happy planning for a wedding with our gold or copper love items!